You probably know by now that I love the colors of the foods that I eat. Obsessed with them. Each time I make something bright and colorful I am amazed and so happy with it. I snap some photos, admire it, and try to share my happiness with those around me, but they don't understand. Such a shame! I have to share it with someone though, so I'm bringing these beautiful colors to share with some awesome people, you guys! This is simple too. Quick, easy, simple, smiles. It's just three ingredients too! 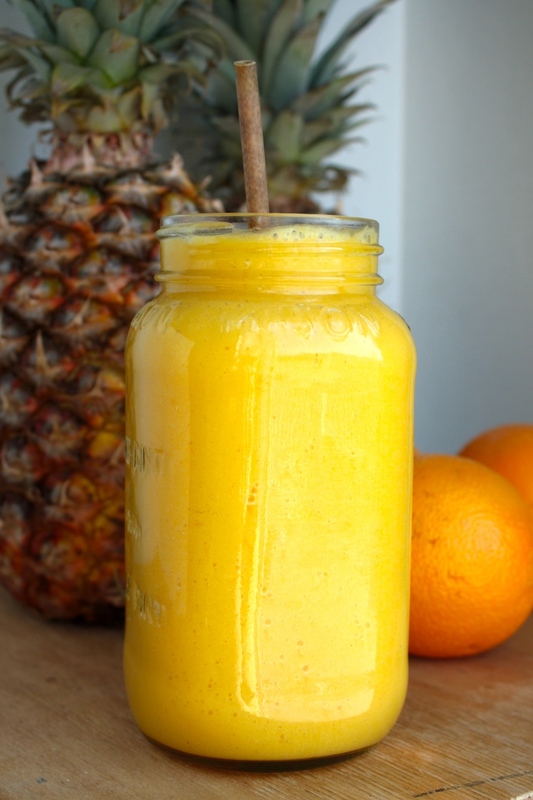 Pineapple, oranges, and ginger (and ice too, but that doesn't count) That's all it takes to become your own little ball of happy sunshine. Love it! Toss everything in your blender or juicer (I used my Vitamix). Blend, serve, enjoy!